Removal of the E36 instrument cluster can be a little tricky, if you don't know all the tricks to it. 1. Remove the two torx screws at top of cluster. 2. Using a thin flat blade screwdriver, carefully pry the top of cluster forward and down. 3. 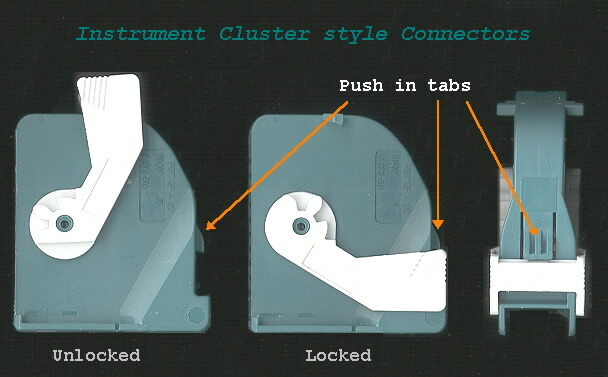 Slide cluster out as much as possible (working it back and forth may be nessesary as it can be a tight fit). 4. Once the cluster is out of the dash pod, you can slide your hand behind the cluster to disconnect the three connectors on back of the cluster. Study the photo below closely to learn how to unlock the connectors, as you may have to do this blindly depending on how much room you have and how small your hand may or may not be. 5. Once the connectors have been removed, the cluster can be slid out to the right of the steering wheel and past the center vent (depending on the clearance of each individual car, the steering wheel may need to be removed to be able to get the cluster out).